To attach each end rail, drill clearance holes in each end then apply glue to the rabbets. With the help of an assistant to hold up the sides on a level surface, position one of the rails and screw it in place with one screw. Check to make sure that it is square, then add another screw. Repeat the process for each corner. 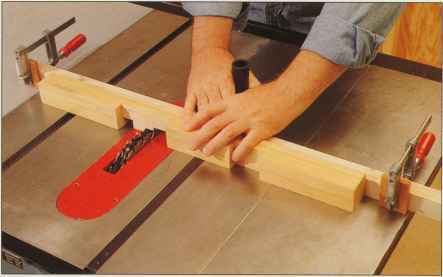 Check the table base for square by taking a measurement across each diagonal; they should be equal (above). If not, place a clamp over the longer diagonal and tighten it slowly until the two distances are equal. Leave the clamp in place until the glue cures.